Over the past several months, the contrast traditionally drawn between the Islamic State's (IS) hardline stance against power-sharing with rivals and Jabhat al-Nusra's (JN) more conciliatory approach has become blurred as JN has sought to build up its 'proto-emirate' project after losing out to IS in eastern Syria. 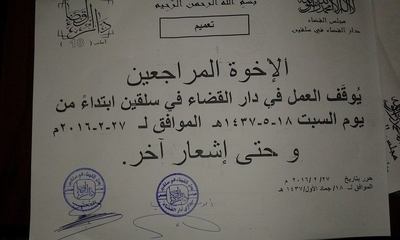 One of the most notable developments in this regard has been the establishment of the Dar al-Qaḍa designed to assert JN judicial monopolies in areas where the group has presence, differing from the prior willingness to share Shari'a committees with other factions- particularly of the Islamic Front- and work to gain control of them gradually. In the east, that approach had some success: for example, in the town of Albukamal on the border with Iraq, JN controlled the Shari'a committee and so arguably was the most influential group in Albukamal despite the presence of several other factions. 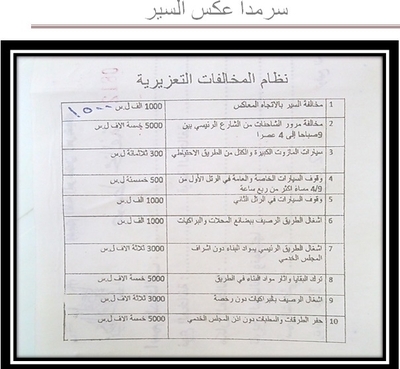 This project, in parallel with the archive of IS administrative documents, aims to archive JN Dar al-Qaḍa documents to illustrate aspects of JN governance better. 1. Recognition of the professional, beneficial principles of verification removed from all forms of harshness, beating or torture of detainees with the Dar except by written decision from the head of the Dar or the qaḍi [judge] before whose oversight is the case of the detainee. 2. The Da'wah and Irshad Office is responsible for making the detainees aware of their rights according to Shari'a and especially the right of bringing charges against anyone who degrades their honour by word or deed. 3. Whoever violates the content of this decision will expose himself to judicial reckoning. And God is the one behind the intention. 1. All entertainment stores that feature billiards, table football and computer games are to be closed. 2. The owner of the store is responsible for looking for another form of livelihood for himself legitimate according to Shari'a. 3. All who persist in practising this vocation will expose themselves to judicial reckoning, detention, confiscation of all tools, and closing of the shop in keeping with the regulations. 1. 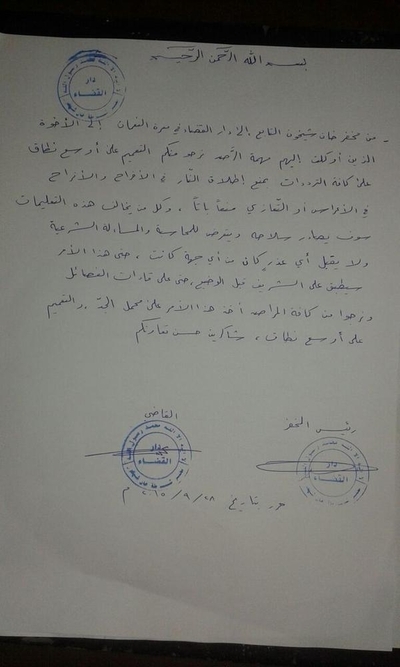 The leadership of the Free Police of Aleppo is affiliated with foreign factions and receives support from them. 2. They have not fulfilled their obligations to the people. 3. The Dar al-Qaḍa is undertaking to secure the suitable alternative to replace these stations/outposts. 1. 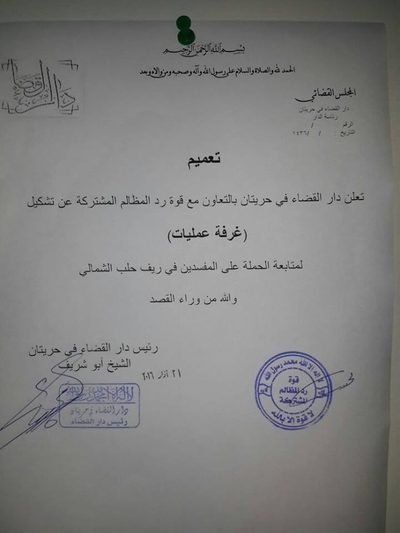 Formation of police stations in the towns of Hureitan, Anadan and Kafr Hamra directly affiliated with the Dar al-Qaḍa in Hureitan and under its administrative authority. 2. Heads of the stations and members for the implementation force are to be appointed in the station by decision of the head of the Dar. 3. All equipment, ammo, weapons and vehicles that were in possession of the previous stations [i.e. the ones that were affiliated with the Free Police of Aleppo] are to be considered under the authority of the new stations for what is in the interest of the Muslim populace. 4. The following defined framework is to be employed for the formation of the station. 7. 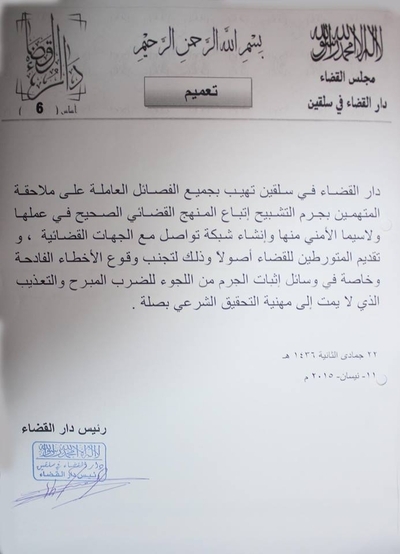 The implementation instructions for the work of the station are to be issued subsequently including: organization of sessions and on-duty calls, organization of protocols, detention period at the station, the means to bring forth reports and complaints and submit them to the Dar al-Qaḍa. All military factions are prohibited from arresting or detaining any person for whatever reason. And in the event of witnessed criminality, the Dar al-Qaḍa is to be consulted to undertake the necessary judicial proceedings. God Almighty has said: "And bow with those who bow." And the Prophet [PBUH] said in the hadith muttafiq alayhi [i.e. appears in both Sahih Bukhari & Sahih Muslim collections]: By the One in whose hand my soul is, I had in mind to order for firewood to be gathered, then to order for the call to prayer, then to appoint a man to lead the people in prayer, then to come up behind some men and burn their houses upon them!" (And this hadith shows the obligation of prayer in the congregation). 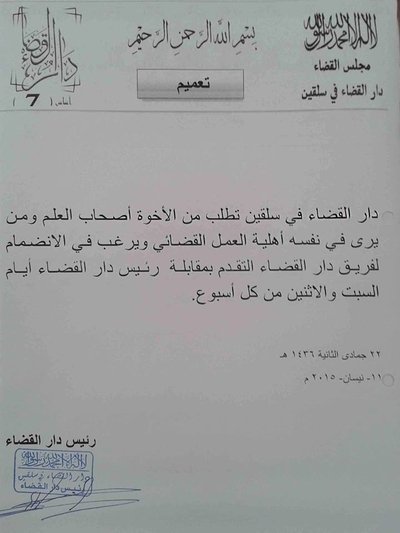 On the basis of the texts of the revelations, we ask the noble people of the town of Kafr Hamra to respond to the call. And that is: to close shops at prayer time and head to the mosque. And this is among the greatest outward rituals of Islam. God Almighty has said: "That and whoever honours the rituals of God: it is from the piety of the hearts." These men admitted their collaboration with the regime and informing it of the movements of the fighters and other deeds besides that. Therefore there was issued against these men the decision for a definitive judgment- legal case 819 that was observed before the room of hudud and reprimand judgments in the Dar al-Qaḍa Hureitan after verifications were completed and the case took all litigation steps and verification of the judgment from the supreme judicial council, and it [the judgment] was publicly implemented on the same date. 1. All families who have been forced to abandon their homes through security circumstances are prohibited from taking by force or [illegally] occupying real estate under any name. 2. All who infringe on alien property will be held accountable and subjected to judicial inquiry. 1. The mixing of males and females in schools is absolutely forbidden in all grades above the fifth [of primary school- c. 10/11 up] and any school in which violation of this statement for distribution is found will be shut. 2. The following subjects are not to be taught: nationalism, music, art and scouts [NB: cf. here]. These are to be replaced with the subjects of the Noble Qur'an, the noble Hadith, Islamic jurisprudence, creed and Islamic manners. 3. Parents of daughters are required to send their daughters in grades above the fifth wearing modest clothing according to Shari'a (jilbab) and no girl student is to be accepted if she is not wearing the hijab. 4. Males are not to teach females in grades above the 5th grade. 5. 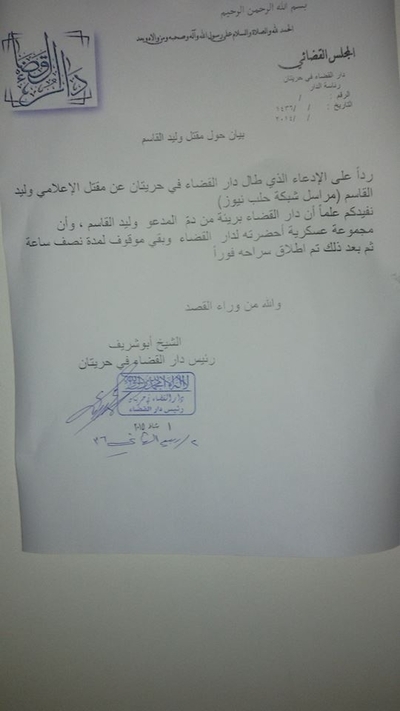 Female teachers and students with adornments are not to enter the school. 6. Female directors alone are to oversee girls' schools. Every violation of this statement for distribution will require for the school to be closed. NB: Note that Darkush was seized by Jabhat al-Nusra from the Syrian Revolutionaries Front in summer 2014. 1. The movement and smuggling of livestock (cattle-sheep-goat-fish) is absolutely forbidden under threat of confiscation of the smuggled goods and imprisonment of the offender. 2. The smuggling of food products in all their types is forbidden under threat of confiscation of the smuggled goods and imprisonment of the offender. This statement for distribution applies to whom it may concern and is considered to be in effect from the date of its issue. The shop has been closed for a period of one whole day because of the violation in opening the shop during prayer time. 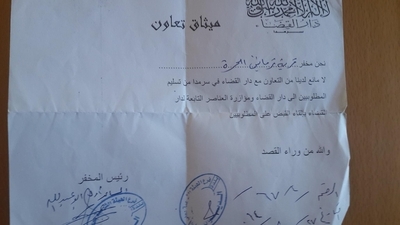 NB: Sarmada was seized by Jabhat al-Nusra from the Syrian Revolutionaries Front in November 2014. Forcing a shop to close for a determined period in violation of the order to close during prayer time is identical to IS regulations. "And you have in qisas saving of life, oh people who understand, that you may become righteous. "- [Qur'an 2:179]. 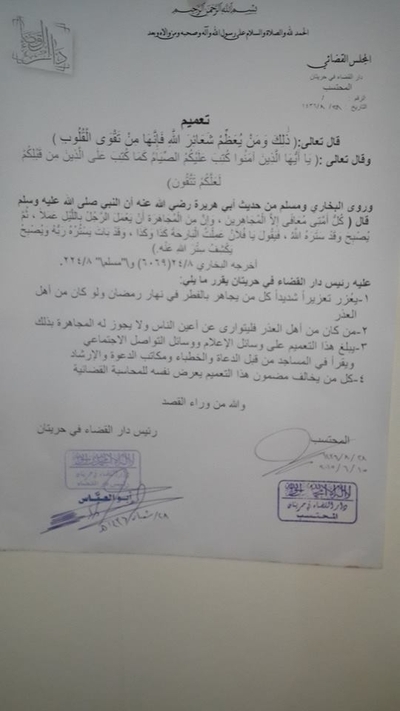 The Dar al-Qada in Hureitan has implemented the ruling of killing in retaliation with respect to the one called Ahmad Hamoud, implementing the decision of the ruling on the case situation 1244/1436 for his aggravated assault on Mustafa Hamoud bin Abd al-Qadir, after the verification committee verified the rulings. 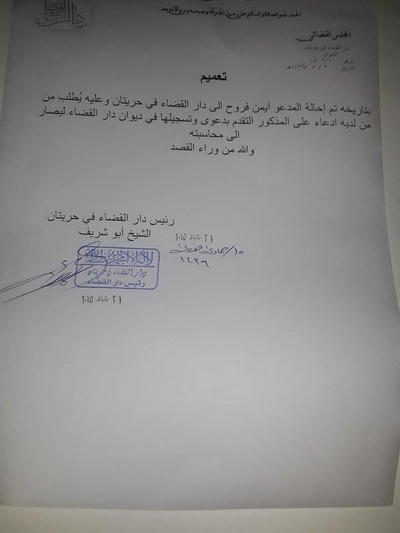 The Dar al-Qada in Hureitan announces in cooperation with the Joint Force to Address Injustices the formation of an operations room to track the campaign against the corrupt ones in the north Aleppo countryside. 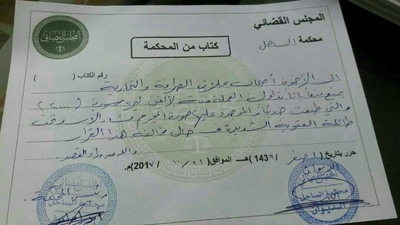 For the requirements of the interest of the Muslim populace, the head of the Dar al-Qada decides on the following: it is forbidden for all military factions to arrest or detain any person for any reason- even if he is caught in the act of the crime. 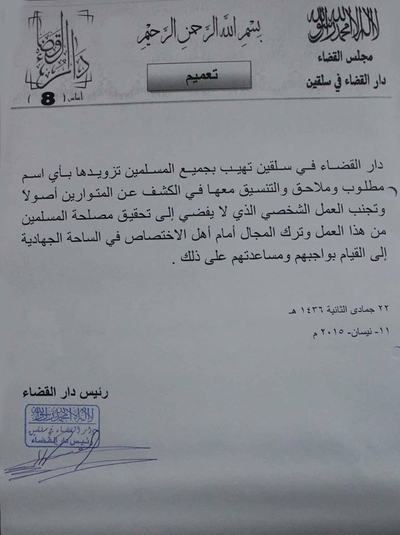 The Dar al-Qada is to be consulted to undertake the necessary judicial proceedings. For the best interest of the Muslim populace, to put out fitnas [quarrels/strife etc. ], and for the requirement of the public interest, we request all mujahideen brothers belonging to all factions not to wear the veil or mask that covers features of the face. 2. The accounting office is responsible for making the detainees aware of their rights according to Shari'a and especially the right of bringing charges against anyone who degrades their honour by word or deed. 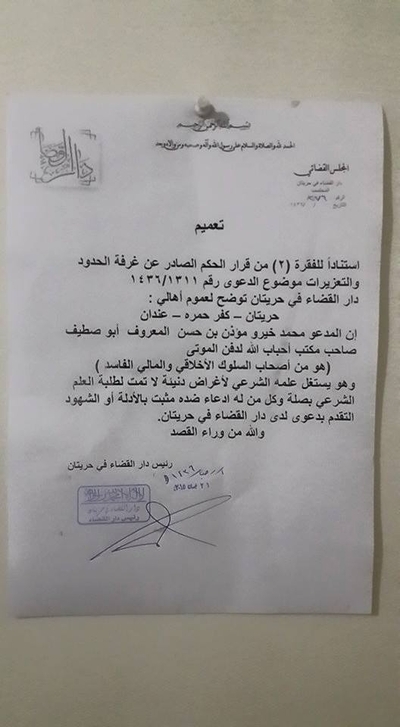 The Dar al-Qada in Salqin reminds all factions working to catch those accused of the crime of disappearance [kidnapping etc.] to follow the proper judicial process in carrying that out- especially the security aspect- and to establish a connection network with the judicial side, and to submit those involved to the judiciary as a matter of principle, and that is to prevent the arising of grave error, especially in the means of verifying the crime, on account of resorting to violent beating and torture that do not relate to the professional process of Shari'a verification. 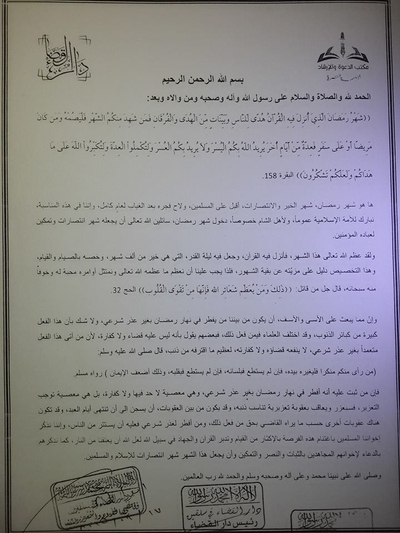 The Dar al-Qada in Salqin reminds all Muslims to provide it with the name of any wanted or caught person, to coordinate with it in finding those who are missing as a matter of principle, to avoid undertaking personal work that does not lead to true benefit for the interest of the Muslims from said work, to leave the field to the people of special skill in the arena of jihad to undertake their obligation, and to assist them in that. 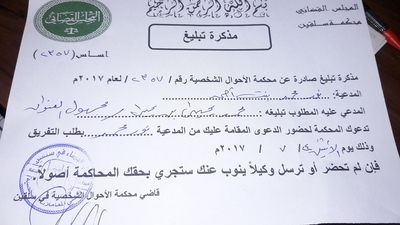 NB: Though not bearing the Dar al-Qada stamp on the original photographed document, compare with Specimen L of a traffic violation ticket in Sarmada, issued by Dar al-Qada. The offences above undoubtedly fall within its jurisdiction too. 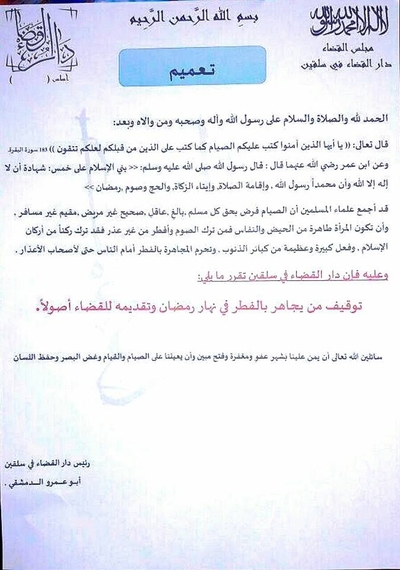 In response to the charge that has reached the Dar al-Qada in Hureitan with regard to the killing of the media activist Walid al-Qasim (correspondant for Aleppo Network News), we inform you that the Dar al-Qada is innocent of the blood of the one called Walid al-Qasim, and a military group brought him to the Dar al-Qada and he remained detained for a period of half an hour and was then immediately released. On the basis of clause 2 of the decision issued by the Punishments and Reprimand Room on case no. 1311/1436, the Dar al-Qada in Hureitan clarifies to the populations of Hureitan, Kafr Hamra and Anadan that the one called Muhammad Kheiro Mue'dhin bin Hassan aka Abu Staif, the owner of the office of the beloved of God for burying the dead, is among those of detrimental character and financial corruption, and he exploits his Shari'a knowledge for contemptible goals that do not relate to students of Shari'a knowledge. All who have charges to bring against him secured by evidence or witness should present their case to the Dar al-Qada in Hureitan. 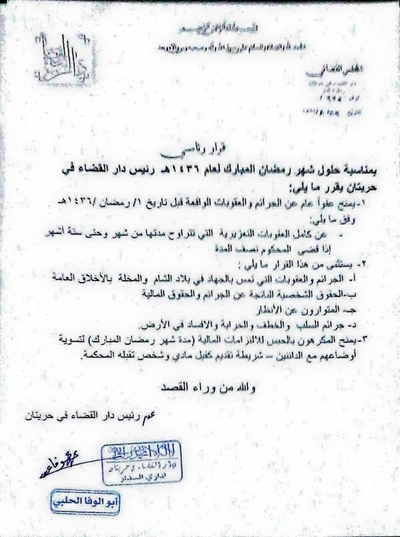 On this date the one called Ayman Faruh has been transferred to the Dar al-Qada in Hureitan and in this regard whoever has charges to bring against him is asked to present the case and register it in the Diwan of the Dar al-Qada, that it may lead to his being held accountable. The Prophet (PBUH) said: "Faith has some sixty branches, of which the highest is the saying 'There is no deity but God', and the lowest is removing damage from the street. '- narrated by Bukhari 9 and Muslim 152. 1. No formation of convoys of cars in public streets especially during peak times. 2. Please keep to the paths specified by the Islamic police corps and the councils in the area according to the organized traffic plan. 3. Please cooperate completely with the Islamic police corps dealing with the regulation of movement of traffic. 4. Avoid crowding together in front of vendors. 5. Brothers involved in military matters must keep to military paths and keep away from the markets. 6. Cooperation is sought from all at risk of judicial reckoning. The Almighty has said: "That and whosoever whosoever honours the signs of God- for they are from taqwa of the hearts." And the Almighty has said: "Oh you who believe, fasting has been prescribed for you just as it was prescribed for those before you. Perhaps you are aware." And Bukhari and Muslim have narrated from a hadith of Abu Huraira may God be pleased with him: that the Prophet (PBUH) said: "Everyone of my Ummah will be safe/exempt except the mujahirun. And the meaning of mujahara is that man does his deed by night, then by day God has veiled him but then he says: 'Oh so-and-so, yesterday I did this and that.' And indeed his Lord had veiled him but then by day he removes God's veil." 2. All who are of the people of legitimate excuse should do so in secret away from the eyes of the people and it is not allowed to engage in public display of that. 3. This statement for distribution is to be published on media, social media and is to be read in the mosques by those who call, preachers and the Da'wa and Irshad offices. 4. All who violate the content of this statement for distribution will expose himself to judicial reckoning. All sentences whose range extends between a month and six months if the one judged has carried out half the period of the sentence. a) Crimes and sentences touching on the jihad in Bilad al-Sham and disgrace to public morality. b) Personal and financial rights resultingly affected by the crimes. d) Crimes of plunder, kidnapping, highwayman crimes, sowing corruption in the land. 3. Those compelled to confinement for financial commitments (for the period of the blessed month of Ramadan) are given the opportunity to sort out their affairs with creditors- conditional on submitting material and personal guarantee to be accepted by the court. "The month of Ramadan in which the Qur'an was revealed as a guidance to people and clear proofs from guidance and criterion, so whosoever of you has witnessed the month, let him fast for it, and whoever is ill or travelling, then an equal number of other days. God intends ease for you and not hardship, to fullfill the period and to glorify God for what He has guided you upon: peradventure you will be grateful. "- al-Baqara 158 [NB: the verse attribution here is a typo: it is actually Qur'an 2:185 and not 2:158]. This is the month of Ramadan, the month of blessing and victories, most accepted upon the Muslims, and its dawn has appeared after the absence of a whole year, and on this occasion, we offer blessing/tributes to the Islamic Ummah generally, and the people of al-Sham in particular, on the entry of the month of Ramadan, asking God to make it a month of victories and realization for His believing servants. And God Almighty has honoured this month, for in it He revealed the Qur'an, and in it He placed the Night of Power, which is better than a thousand months, and He designated it for fasting and undertaking, and this designation is evidence of its distinction from the rest of the months, so we must honour what God Almighty has honoured and we must follow his commands to love Him and to fear Him in His exaltedness. Exalted is He who says: "That and whosoever honours the signs of God, for they are from the taqwa of the hearts. "- al-Hajj 32 [Qur'an 22:32]. "Whoever of you sees someone doing wrong, let him change him by his hand, otherwise by his tongue, otherwise in his heart, and that is the weakest of faith. "- narrated by Muslim. 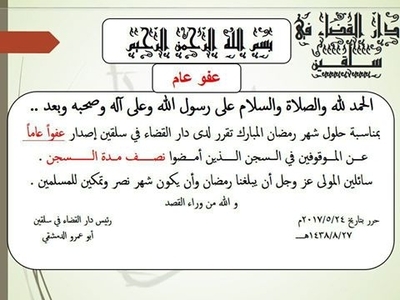 Thus it has been established that the one who breaks his fast in the daytime of Ramadan without legitimate excuse according to Shari'a, constitutes an act of disobedience on which there is no hadd punishment or penance, but it is an act of disobedience that must be rebuked, so he will be reprimanded and there will be a consequence of reprimand appropriate for the person's sin, and it is possible that among the consequences will be imprisonment until the days of Eid end. And it is possible there will be other consequences according to what the qadi observes with respect to the person who did that. And the one who breaks the fast with legitimate excuse according to Shari'a must hide it from the people. And we remind our Muslim brothers to seize the opportunity to increase qiyam prayer, meditation on the Qur'an, and jihad in the path of God, so perhaps God will save us from the Hellfire. Similarly we remind them to pray for their mujahideen brothers to attain steadfastness, victory and realization: and that this month should be made the month of victories for Islam and Muslims. God's blessings and peace be upon our Prophet Muhammad, his family and his companions, and praise be to God the Lord of the Worlds. 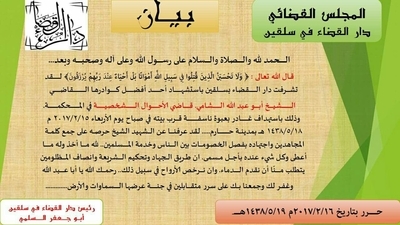 Head of the Dar al-Qada in Salqin etc. Defendants: The heirs Ahmad Awsu Abd al-Rahman and Abd al-Raheem- trustee and eminence of the heirs Ibtisam, property heirs. Real estate no. 1480 (10/2) in the real estate area of Salqin has been submitted for public auction by dossier file no. 40 for year 2015. The location of the real estate is on the Idlib road- near al-Misa alley of the house of Abd al-Majeed reaching the real estate from the public street to the crossing of the alley whose length is 12 metres. The real estate is composed of an entrance onto the alley and a facade on the alley of length 7.3 metres, and it possesses a corridor, separate entrance and a courtyard by area 6 by 3.7 metres. And on the right is a kitchen 2.5 by 2 metres, and within it a bathroom of 1.5 by 2 metres, and beside the kitchen, a provisions room of 3 by 2 metres. Beside this room is a room of 4.5 by 3.5 metres, and in the heart of the abode is a big room of 7 by 3.5 metres. Ascending from the courtyard of the home to the second floor, one finds a room above the entrance of the home, a kitchen and bathroom 330 by 4 metres [typo- 3.3 by 4 metres] and there is a balcony above the entrance extending onto the alley and another extending onto the courtyard of the abode from the inside. And from that is a set of stairs that go up to a room above the room extending over the alley also 3.3 by 4 metres beside which is a toilet and in front of it is another set of stairs going up to the room's roof. Let it be known that this real estate has a roof over the room extending over the alley only and as for the rest of the rooms, they do not have a roof. 2. The session will not be held unless there are three or more participants. 3. 200,000 Syrian pounds are to be paid to the public auction into the implementation deposit before the beginning of the auction. 4. In the event one does not win the auction, the cash advance will be returned to the one who paid it in its entirety without any fee/tax. 5. Whoever wins the auction must pay out the rest of the sum within 3 days of winning. 6. The real estate will be handed to the buyer in the auction devoid of things occupying it and occupants after paying the whole sum directly. 7. In the event that the bidder does not live up to his side of the deal, a fine will be imposed from he court. 8. This announcement will be published on the doors of the mosques, and on the board of Dar announcements, and in the public squares, and the occupier and the occupant and executant will be notified immediately. The Almighty has said: "And do not come near fornication: for it is ever an immoral deed and evil in path" [Qur'an 17:32]. So when the man and woman commit fornication, render to the two of them the final decision as exemplary punishment from God, and God is Glorious, Wise...and the Prophet (SAWS) stoned a man whose name was Ma'iz and a woman whose name was al-Ghamidiya (as per the two Sahih collections). When the fornication involves a mahram [relative/guardian] among the masses of the people, its taboo is worse and more calamitous when it occurs among maharim and many of the jurists have been of the opinion that the one who forcinates with maharim is to be killed absolutely, chaste [muhsan] or not. And it has been narrated from Imam Ahmad (may God have mercy on him) that he said: "The one who forcinates with one's mahram is to be killed in any case." 1. Implementation of the hadd punishment of stoning until death on the muhsana called Muntaha Baytar for committing the crime of fornication with her son. 2. Implementation of the hadd punishment of stoning until death on the muhsana called Rania al-Masri for committing the crime of fornication with her sister's son. 3. Implementation of the hadd punishment of stoning until death on the muhsan called Marwan Hamal for committing the crime of fornication and the acts of the people of Lot [homosexuality]. And God is predominant over His affair but most people don't know it. The Almighty has said: "Oh you who believe, do not take the Jews and Christians as allies: they are allies to each other. And whoever of you sides with them is one of them, and God does not guide the wrongdoing people" [Qur'an 5:51]. 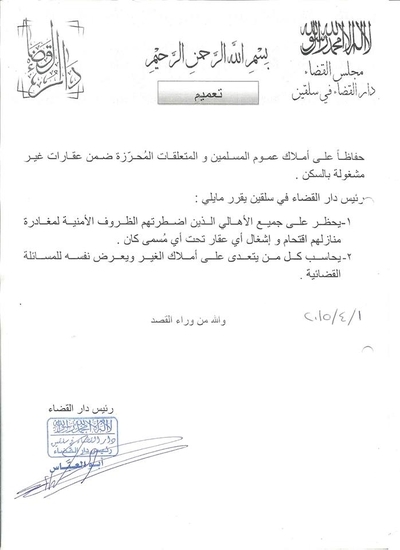 Committed the crime of collaboration with the regime and the issuing of a decision from the hudud punishments and reprimands judge in the Dar al-Qada with the condemnation of them for committing this crime and the verification of this decision from the judicial council for the Dar al-Qada: the ruling must be implemented with regards to them and it is death for apostasy in their supporting and aiding the disbelievers to kill the Muslims. 1. Killing of As'ad Lababidi bin Ahmad as hadd punishment for his committing deeds of the people of Lot and fornication with his mother. 2. Killing of Muhammad al-Masri bin Abd al-Hameed in reprimand for fornication of maharim with his aunt. The Almighty has said: "And Lot, when he said to his people: 'Do you commit such immorality such as no one from the worlds has preceded you in committing? Indeed you come to men with desire instead of women, but you are a people of transgression" [Qur'an 7:80-1]. Al-Tirmidhi, Abu Dawud and Ibn Maja narrated from a hadith of Ibn Abbas (may God be pleased with them both): he said: the Messenger of God (SAWS) said: "Whomsoever you find committing the deeds of the people of Lot, kill the doer and the receiver"- authenticated by al-Albani. Indeed the deeds of the people of Lot- i.e. the performance of males- is among the greatest of the great sins, and God damned the people of Lot in many verses for this great sin, and the Exalted has affirmed that it is immorality such as no one in the worlds had preceded them in committing, and God punished them for that with what He made clear in His Book, in making their land disappear and raining stones upon them. And the Companions have agreed on killing the one who does the deeds of the people of Lot. Killing all of the following: Ahmad Kalash bin Muhammad, Firas Hamdan bin Ismail, Ali al-Hussein bin al-Hassan, reprimanding their undertaking of the deeds of the people of Lot by gunfire after their full admission, not merely suspected, of their doing it in case 1257/2015. And after verifying this decision from the judicial council for the judicial body, the committee to implement the rulings has decided to implement the ruling according to Shari'a principles. 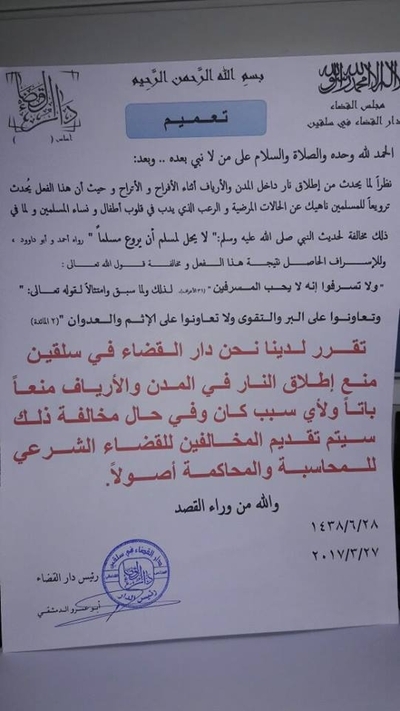 From the station of Khan Sheikhoun affiliated with the Dar al-Qada in Ma'arat al-Nu'man to the brothers to whom it entrusted the pledged task, we ask you to spread out to the widest points on all frequencies to prevent all gunfire in the joys and grief of weddings and funerals. All who violate these instructions will have his weapons confiscated and expose himself to Shari'a reckoning and inquiry. And no excuse will be accepted from any side, such that this order will be applied...even on the leaders of the factions. We ask all observers to take up this order as far as possible, and spread out as far as possible. Thank you for your cooperation. Notification issued by the court of personal circumstances no. 2357 in 2017 CE. Plaintiff: Nour Muhammad bint Ahmad. Defendant: Muhammad Yahya bin Yahya...The court calls on you to attend the case brought against you by the plaintiff Nour Muhammad in a separation request. That will be on Monday 24 July 2017 CE. If you do not attend or send a agent representing you, the trial will duly take place against you. 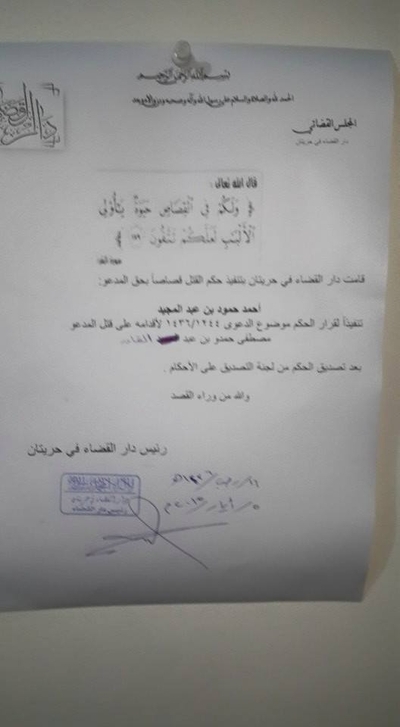 We, the station of the free village of Tarmanin, have no objection to cooperating with the Dar al-Qada in Sarmada in handing over wanted persons to the Dar al-Qada and supporting the personnel affiliated with the Dar al-Qada in arresting the wanted persons.